The first lady chose a piece by the Italian designer to wear on Friday. First Lady Melania Trump wore an eye-catching multicolored jacket that retails for more than $51,000 while stepping out in Sicily on Friday. #Repost @stefanogabbana US First Lady Melania Trump arrives for a visit at the Chierici Palace City Hall of Catania on the sidelines of a G7 summit of the Heads of State and of Government in Taormina ?????????? THANK YOU @flotus #melaniatrump ? #DGWoman #DGStyle ??????????? 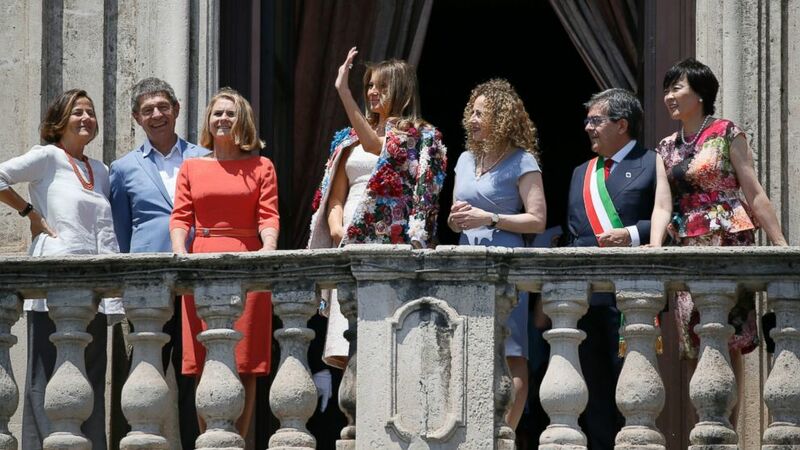 (Domenico Stinellis/AP Photo) First lady Melania Trump, center, waves as she stands with; from left, spouse of Italian Premier Paolo Gentiloni Emanuela Mauro, spouse of German Chancellor Angela Merkel Joachim Sauer, spouse of European Council President Donald Tusk Malgorzata Tusk, Amanda Succi, partner of the mayor of Catania Enzo Bianco, Mayor Bianco and spouse of Japanese Prime Minister Shinzo Abe Akie Abe, on the balcony of Chierici Palace, part of a visit of the G7 first ladies in Catania, Italy, May 26, 2017. Neither Dolce & Gabbana nor the White House have responded to ABC News' request for comment on the record.